I’ve seen the future of conferences. And it runs my code! This past weekend I had an amazing experience. I went to the 1st OpenSimulator Community Conference, which I helped organize (besides helping write the server that made it possible, too). The term “went” is not quite right, but it’s not wrong either. 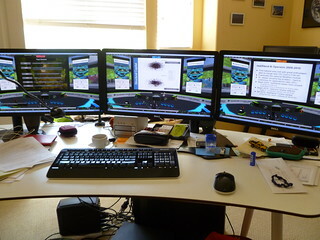 Physically, I didn’t go anywhere other than my home office: the conference was held in a virtual environment. Mentally, however, I went to this conference, almost as intensely as any other conference that I’ve been before. I was an organizer, a speaker and an attendee, and I felt myself in those roles just as strongly as I did in other conferences I helped organize. I stressed with technical and organizational glitches, focused when giving my talks, and was inspired by some of the talks I attended. I enjoyed visiting the sponsor displays and finding out more about them. I “came back” from the conference tired, but energized, feeling that the people who develop and use OpenSimulator have just gone through a transformational shift — from a bunch of unrelated individuals to an actual community. Of the dozens of conferences and workshops I have attended in my life, I had this feeling exactly once before, at a workshop we held at PARC back in 1996. My family respected my time to attend the conference by not interrupting me [very often]. At the end of each day, I instantly teleported to my real world home, specifically the kitchen, as I suddenly realized I was starving. The strong positive experience came as a shock even to me, who have been working in these environments for several years, including experiences with events in Second Life. This event was really something else, and it left a strong impression not just on me but on the 360 people who attended. A conference is a large group of people coming together at the same time, in real-time, to share experiences formally and informally. In order to have a conference feel, same time-ness is important; same physical place is not important, and it will become less so as the technology for remote presence improves. The experience we all shared this past weekend was the fuzzy image of what’s to come. As we start exploring alternatives to the mouse and the flat screen — things like the leap motion and the Oculus Rift — things will get a lot more interesting in online real-time interaction! Engagement on the part of the participants. The people who participated were truly engaged in making the most out of the experience. I have a feeling this is perhaps the most important element of any conference, physical or virtual. When people don’t really want to be there, the conference experience is sort of flat. You see that sometimes in RL conferences when people bury their heads in their computers during the sessions, don’t ask questions to the speakers and don’t interact much with each other during the breaks either. The OSCC13 volunteers took on their task with a gusto that put many RL conference volunteers to shame; the students in the Air Force Lab poster session were full of enthusiasm when prompted about their summer projects; the speakers showed care and commitment in their talks, slides and performances; the participants were a lively bunch, constantly chatting and engaging with what was being said by the presenters. Engagement is contagious, so even participants who weren’t really sure what they were going to find ended up being caught in the energy. The liveliness of the environment. OK, so the students who built the virtual conference center based on the Universal Campus went a bit crazy with glow, but it really worked! Visually, the environment was fun and playful. 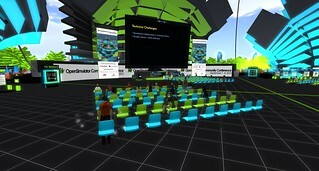 It was a strange mixture of familiar and unfamiliar elements: things like screens, chairs, podiums and banners are to be found in any conference center, but crazy-glowing, cube-like trees and blue grid-like terrain are completely out of this world, and ported everyone into a video game. The open-space plenary room (which ended up happening serendipitously), with its bright green and blue chairs at the same level as the speakers’, gave a feeling of accessibility to the speakers that was quite refreshing. Attention to detail in the interaction design. This is one of my pet peeves. One of the things I hate in most user-generated environments in SL and OpenSim is the lack of attention to detail in interaction design. Most modelers focus on producing beautiful environments assuming that the users are experts and know how to interact with the environment, specifically the camera. This is simply not true. Even people who have a lot of experience sometimes have trouble understanding what is it they should be focusing on in a 3D space. (This is also true, to a lesser extent, in physical spaces) Besides the presentation system itself, which came directly from my my vLab, my other contribution to the build were scripts for placing the cameras in exactly the right spots for everyone, as they sat down. Expert users could then move their cameras at will, but that very first position of the camera was a strong signal for what their role was and what they should be looking at. I’m not sure anyone noticed this detail (I know at least one person did), but it’s the accumulation of unnoticeable details like this that produce a positive user experience. Not possible in real life. OSCC13 had a few plenary sessions and several sessions with parallel tracks, just like many RL conferences. In RL conferences, when there are parallel tracks, we must choose which track to attend. In this conference, I often found myself in more than 1 track at the same time. While my brain still can’t process more than one audio stream at a time, I could see the slides of the others, and toggle the audio stream every so often. It was like having my own mixing table over the live event. Crazy and very intense! Socials. Web conferencing systems don’t have this concept, but this SL-like environment does. 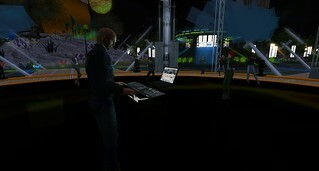 Besides the sessions, the conference included several social events, some of them with live music. That’s right, live. That means that someone (in the case of the picture, a guy somewhere in Denmark) was spinning records, interacting with the crowd and streaming the audio into everyone’s computers at home. People usually put their avatars in a dance animation and chitchat the hour away (that’s what I did). Not sure if they are dancing at home or not, probably not. A time will come when our dance moves at home will be directly represented in the virtual space, and we will all be dancing together for real, while chitchatting. No central authority. 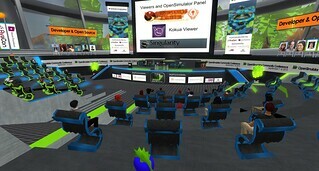 The importance of this point may be difficult to understand for people outside the OpenSimulator community, but this conference was the first large virtual event that separated the authority of the venue from the authority of the attendees. Let me try to make a parallel: it was like a Google hangout where people could show up with their Yahoo! and university identities. 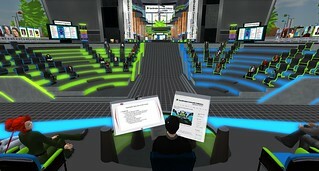 About 40% of attendees came with their own accounts in other virtual environments. This gave everyone the good feeling that there is no central authority, that they can set up their virtual identities and pixelated appearances independent of the conference, but that we can all get together nevertheless. Many people reading this blog post may think I’m crazy and that I drank some old kool-aid from 2008, when the hype surrounding virtual worlds was at its peak. Well, I am crazy, thank God, but I’m not the only one. The fact that the hype bubble was busted is a relief for me: it’s a really bad feeling to work on something that is hyped way beyond what it can do. I’m much happier now that the technology has entered the slope of enlightenment. Real-time virtual reality opens up connections that are not possible in physical space but that feel natural to our prehistorical brains. Attending a conference is much less a physical act than a mental one, so we can make those connections in virtual space. And while today’s VR is still clunky as hell, and there’s much to be done to inject our physical bodies in it, there’s an unstoppable train coming our way, because what drives technology is the ideal of transcending physical limitations. P.S. I hate traveling. After this experience, I’m not sure I will ever want to attend a physical conference ever again. This entry was posted in conferences, simulation, social software systems. Bookmark the permalink. And I definitely did spot the attention to detail in the placement of cameras for speakers, moderators and seated attendees in the various sessions. They were very well crafted and I do know they were extremely helpful to those who are not so sure how to move their camera separate to their avatar. It also means speakers had a common frame of reference for what they put on their slides and in objects they interacted with during their talks (like an NPC/bit in one excellent talk). Like yourself, I was able to be in “two places at once” (I must get a three screen setup like yours next time) by listening to one talk and watching the slides in another viewer window, occasionally dipping in to the audio stream for that second session. That’s something we just cannot do in a real event… hey.. I have even been to am IJCAI conference in LA where even though I paid a vast fee, I could not get into pretty much ANY session as there were queues out of the door for those sessions you wanted to attend. You ended up wasting time being there early and queuing (Disney style) and wasting valuable time. 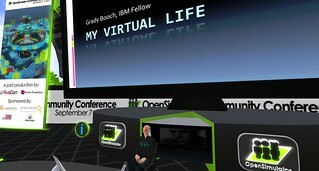 None of that in our virtual conference, not even walking time with the teleport signs. We do need our intelligent agents to really watch these session for us and act as our “personal conference director” to draw our live attention to those things we need. I might take a look at that as a student project! Meals were a problem.. real meals… there was so much going on, even the breaks were filled with product announcements and meet ups. I found a planned (real family) dinner got squeezed to 20 minutes. Sitting still so long on a weekend is something we need to address, and I suggest next time we have a jogging track and sports area, and make it so we get everyone to do REAL exercise to a fitness training… no sitting down when dancing too in future! Actually, that is a serious suggestion. I will write up some notes on my own experience too. Thanks for your notes, and for your fantastic contributions to the platform and the event. Great article, Crista. Thank you for summing up what I know many of us felt while attending this conference. I also had no idea such a high percentage of folks were visiting the conference via Hypergrid connections from other grids. (40%!). That’s outstanding and speaks volumes about the growth of the Hypergrid. Excellent article. I shared the exact same experience at the conference (well, not exact, I didn’t have all the stress you organizers were under). 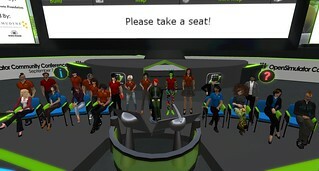 One thing I noticed was the big advantage a virtual venue like this provided: the ability to chat and comment with other attendees during the presentations and panels, without being rude and interrupting the speaker. This multi-channel communication really enhanced the experience. Nicely written article Prof. Lopes. I am wowed by the graphic details that you guys have kept in mind. It’s super wow. Thank you for the excellent article. Simudyne enjoyed sponsoring the event and we look forward to further collaborations with the Opensims community. We were more than happy to use the event to launch our new viewer for the Surface Pro. We received wonderful feedback on the beta version and we really appreciate folks taking the time to do so. Thank you!! Thanks a lot for your article Crista. It describes perfectly my own feelings during the weekend. I just acted as a greeter, a humble role but I wanted to be “part of it”. I agree with Ai Austin, exercise time is a must in that situation, we need standing places to work and not sitting ones. I have been looking for the scripts of camera control that helped to position it so swiftly but I couldn’t get any, are you going to release them in CC? that would be great! Thanks for one of the nicest times of my recent life! Yes, I will release these scripts. I’m hoping we can package some version of the Breakout Zones in CC license. Just got pointed to this blog and just wanted to add that I really enjoyed this-)) I watched some of the events live via ustream, am still watching others recorded, and have shared several…great job folx!! I am a physicist and therefore not an expert in computer science, so I may offer perhaps a different point of view. It is a great idea and I can see the benefits of this conference format, but do you have any thoughts about how to make this conference format more accessible for people outside computer science? Is it anywhere near to being a portable software that can be installed and easily set-up by non-experts? Finally, do you have an idea of the average age of the participants of this conference? It seems to me an almost impossible task to convince an academic older than ~50 to participate in this kind of conference. In other words if the senior people don’t come then you can’t organize a serious conference…This is probably just a standard cross-generational ‘conflict’ which can only hardly be overcome, but perhaps your experience is completely different?